Upcoming film of Bollywood actress Raveena Tandon, Maatr deals with crime against women in society. Raveena says that the intention behind making the film is to create awareness among the audience, not a box office hit only. 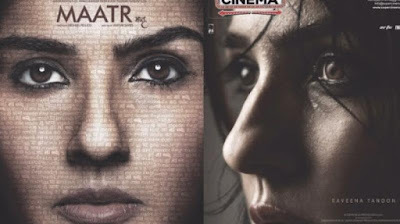 Trailer of the film Maatr has been launched and on that occasion Raveena said: "Intention behind 'Maatr' is not commercial success but to spread a message of crime against women. This is the need of the hour, where people should start changing their mindset about women and take action against such criminals instead of shaming the victims based on the length of their clothes." The women-centric film, Maatr is all set to release on 21 April.